Bienvenue President Hollande! Vive les Etats-Unis! Vive la France! I’m not one to ever win things. There was that one time I won a cake on a cake walk at a fair at my first elementary school, but I also remember on the day of my 8th birthday party, my father bought two scratch tickets and let me scratch one and my brother scratch the other. I won $40 and my brother won $10, and it felt like it was the universe’s way of wishing me a very happy birthday. But that’s the last time I ever remember winning something so random. 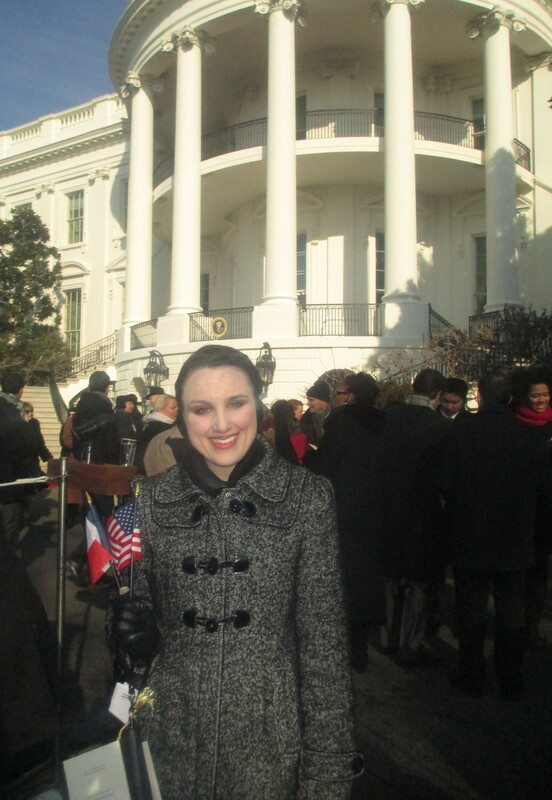 The universe seems to have finally come together again for me as last Tuesday, February 11, I was invited to attend an official ceremony on the South Lawn of the White House to welcome the president of the French Republic, Francois Hollande, for his State Visit to the United States. There were all kinds of historical markers for this event, seeing as how it was just the sixth State Visit to take place during Obama’s administration and the first State Visit of a French president since 1996 (which was before my students were born…woof). I had been scrolling through my Instagram while curled up the couch on a snow day when I saw a post from the White House account (@whitehouse) to apply for one of their White House Socials (wh.gov/social). 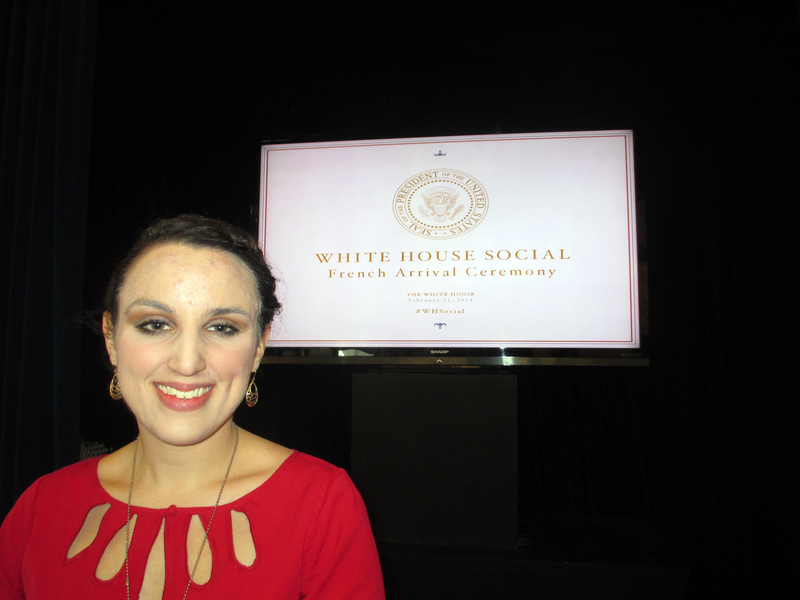 Launched by the White House Office of Digital Strategy, White House Socials aim to involve everyday citizens in major White House events and encourage those who are selected to attend to share their experiences via their social media channels, using hashtags like #WHSocial and #AtTheWH to track their experiences. I must confess I had never heard of this initiative, but clicked on the link thinking “Why not?” All I had to do was provide some basic contact info and a 140-character explanation as to why I wanted to go. “How to wrap up such a desire in one post? !” I thought. I settled on an abbreviated explanation of how I felt the experience would be incredible to share with my students, especially my tenth grade European history classes since the event would provide a great connection between what they learn this year and the history of the United States that they will learn in eleventh grade. I clicked “submit” and seeing that the date of the event was just days away, on a weekday no less, I thought “Watch me get picked.” Imagine my surprise when I received an email the next day saying that I had been selected. 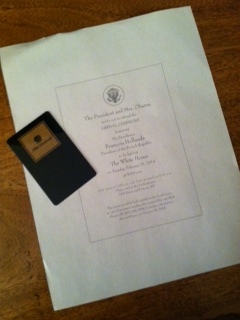 Official invitation and my hotel key. Getting the go-ahead from my boss to take a day off, (“Brianna, you HAVE to go” he enthusiastically declared after I expressed my uncertainty over buying plane tickets and being out for a day right before February vacation week), I got home that night and frantically searched for flights and hotels, weighing all sorts of transportation options and searching for flights that would allow me some extra downtime in the nation’s capital. I settled on an evening flight on Monday into Baltimore and a 8 pm return the following day, allowing me a full afternoon of frolicking in DC. Since I had to leave right from work, the easiest, least expensive line of transportation was to drive to Alewife station on the Red Line, take the T to South Station, and jump on a Silver Line bus to Logan. Once I landed in Baltimore, I had to take a bus to a MARC commuter rail station just a mile from the airport, ride the train to Union Station in DC, then transfer to the Blue or Orange line to reach a station just two blocks from my hotel. It sounds complicated, but I managed it all without any complications, and I seemed to catch each connection in 10 minutes or less of arriving at each transfer point, very reminiscent of the “Founding Fathers are watching over us” vibe that my friend Tiffany and I got in our crazy Inauguration weekend adventures just over a year ago. From the MARC train, I caught a quick glimpse of the Capitol building, at which point a felt a sly smile spread across my face. It would be just minutes until I would arrive in what has become one of my very favorite places. My hotel was on Pennsylvania Avenue, one of the most reasonably priced options I could find and just half a mile from the White House, called the Hotel Lombardy. It was the most luxurious stay I have ever had, with a quaint shutter over the door to my room, a dainty vanity to sit and do my White House-worthy make-up that next morning, and a king bed to have all to myself. 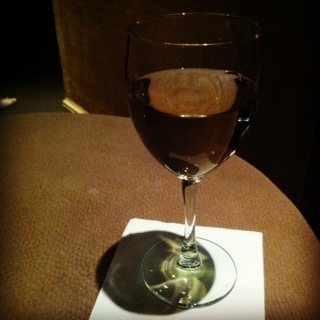 Once I checked in and settled into my room on the tenth floor, I headed down to the Venetian Bar and Lounge on the first floor, and relaxed in a tiny, dimly lit nook away from the bar where a group of Texans sat, and ordered a glass of Riesling, in keeping with the French theme of the next 24 hours. As I sipped on the perfect drink to end about 6 and a half hours of travel, I read up on President Hollande and the plans for his visit to the United States, thinking all the while that this kind of lifestyle suits me quite well. One of the many views that made venturing out into the cold totally worth it! 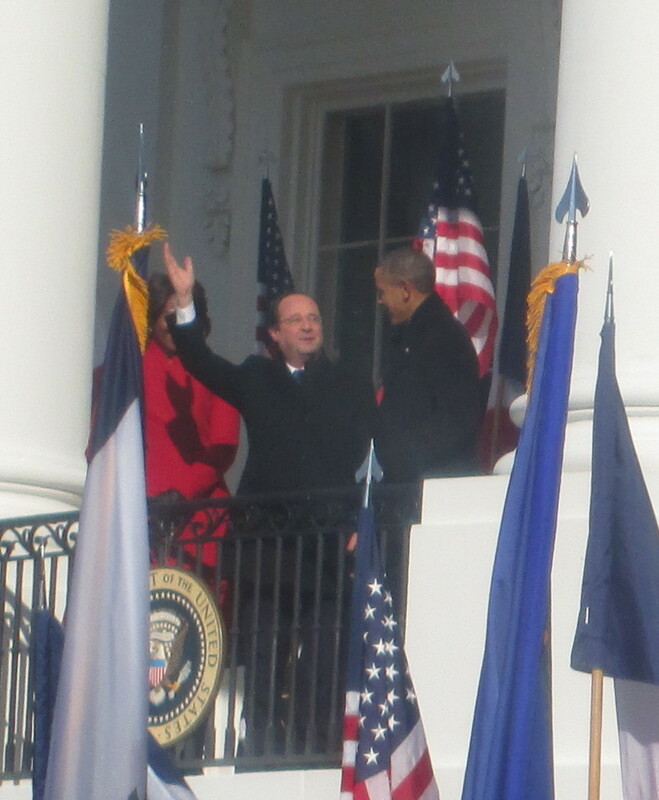 President Obama and President Hollande then walked across a raised platform and onto a stage. The crowd of nearly 4000 were mostly silent, and someone near me whispered, “That’s him” and I got an instant chill at gazing at our president with my own eyes. Both the French and American National Anthems were played, and it really was amazing to be in such a large crowd that recognized the importance of silence at such a moment. Afterwards, both leaders gave speeches, pausing every few sentences for a translator to speak their words in the other language, which as someone who studied French for 7 years, I appreciated the chance to check my French-speaking ability. As a history teacher, I greatly enjoyed how each spoke of the long history between our two nations, how we stand for the same values and principles. I had heard somewhere that a State Visit is not merely a meeting between two leaders, it is a meeting between two countries, and that was so apparent. Sure, Obama and Hollande represent America and France now, but their partnership also represents just one chapter in this historic alliance. (L to R): Mrs. Obama, Pres. 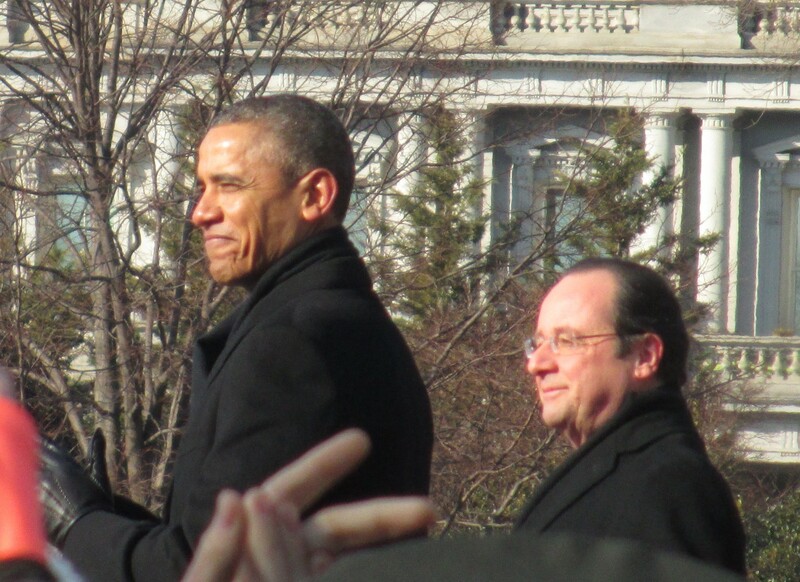 Hollande, and Pres. 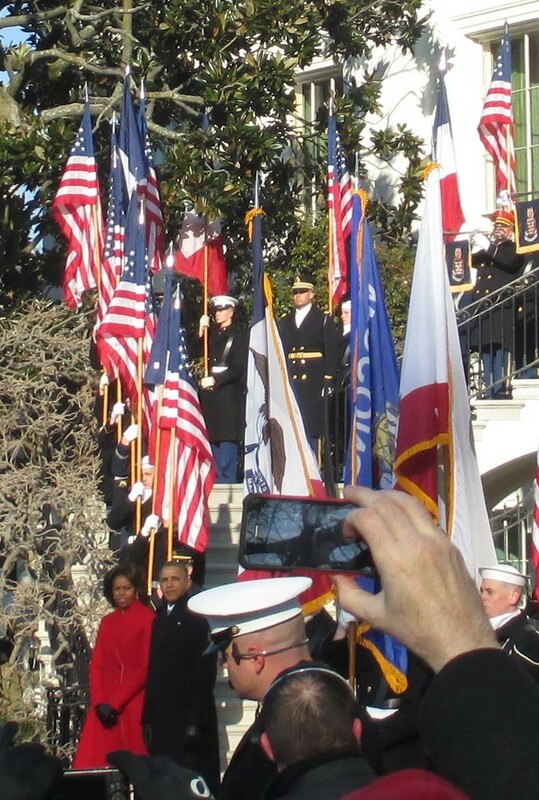 Obama on the South Portico porch. Afterwards, Presidents Obama and Hollande, with Mrs. Obama following them, walked up the steps to the South Portico and paused on the porch to wave to the crowd. Of course, I started taking pictures, but when they turned towards me, I had to stop viewing it all through the screen of my camera, and just appreciate the fact that I was really there on the South Lawn, with two major world leaders looking in my direction and waving at me. After the ceremony, I went to the Eisenhower Executive Office Building with the other 100 White House Social attendees to attend a panel discussion by White House officials. I listened to members of the White House Visitors Office, the National Security Council, the Office of Digital Strategy, and the State Department about the process of planning such events as well as the use of social media in government. I was inspired by how easy it is to be engaged in government now. The State Department representatives spoke of this concept of “public diplomacy,” which as they explained is the idea that diplomacy doesn’t take place just between diplomats, but between everyday citizens as well. Social media has created an opportunity for engagement that we’ve really never seen before. You can sign your name on a petition you’re passionate about on “We the People” on the White House website, see snapshots of the preparations for a State Dinner on the White House Instagram account, or follow a U.S. ambassador on Twitter and hear about his or her work in a foreign nation. In casually visiting any of these sites, you can learn about an issue or event that you may not have heard about on the news. As a teacher, I view it as a tremendous educational tool, and from what the officials I heard from shared, it seems that an increasing number of government officials in all levels of government are realizing this as well. I spent the rest of the day fitting in as much as I could in DC. Seeing as how it was the day before Abraham Lincoln’s birthday, I decided to walk over to the Lincoln Memorial to reflect on one of my favorite presidents. On the way, I walked along the Vietnam Wall. As I slowly walked and gazed upon the names, I came across an older gentleman with younger men who appeared to be his son and grandson. The older man looked for a name, placed his hand on the wall, and became visibly emotional. I watched from a distance, tears forming in my own eyes as well at this emotional tribute of one veteran to a friend. I turned away, feeling like I was intruding in some way even though I was nearly 50 feet away from them. I continued to Lincoln, looked into his stone eyes, read his Second Inaugural Address and the Gettysburg Address on either wall, and silently reflected on what his presidency accomplished for our nation. It was quiet and cold, and once a somewhat large tour group arrived, I continued on, choosing to walk by the Korean Memorial, and was struck by the individualism in each figure’s chilling face. I then made my way along the mall in the direction of the Washington Memorial for next up was a visit to the National Archives, the one stop I had been anxious to make last year but had been unable to. There, I viewed the three founding documents of our nation that I have researched over and over and taught to my students: the Declaration of Independence, the Constitution, and the Bill of Rights. Exiting the Archives, I decided to walk towards to the Capitol to take more pictures, and realizing that it was before 4, decided to go inside to see if there were any more tours for the day. I caught the last 10-minute Rotunda tour, but that was plenty for me. Walking through those halls, I couldn’t help but think of all the legislators who had walked the same halls. 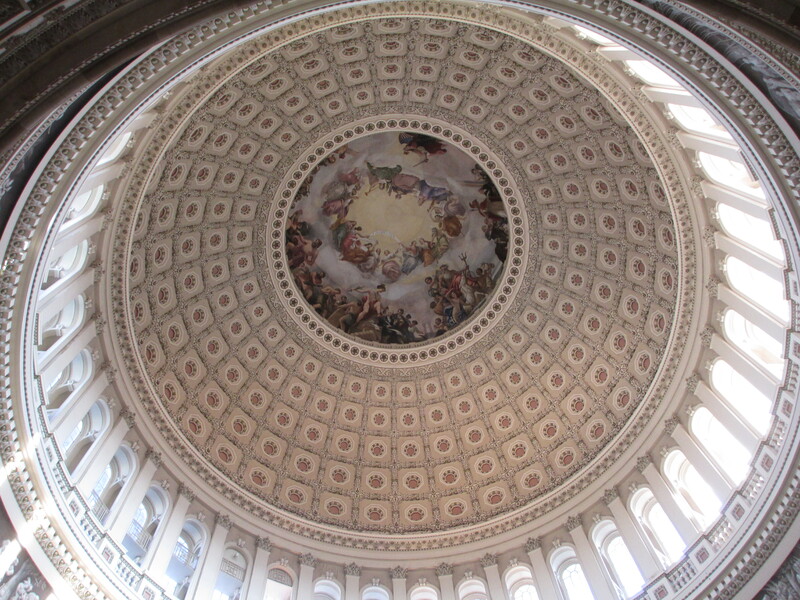 I gazed up at the Apotheosis of Washington, looked in the eyes of yet another Lincoln statue, as well as those of several other presidents, and spent time contemplating the various paintings and sculptures on the walls that depict how our nation progressed from an untamed wilderness to the symbol of freedom that it is today. Finally, it was time for me to make my way back to my hotel to pick up my bag and then travel the Metro and MARC train to get back to Baltimore for my flight home. It was a whirlwind trip (from leaving to returning home, everything took place in just 32 hours), but one that I feel extremely privileged to have made. DC has captured yet another piece of my heart. 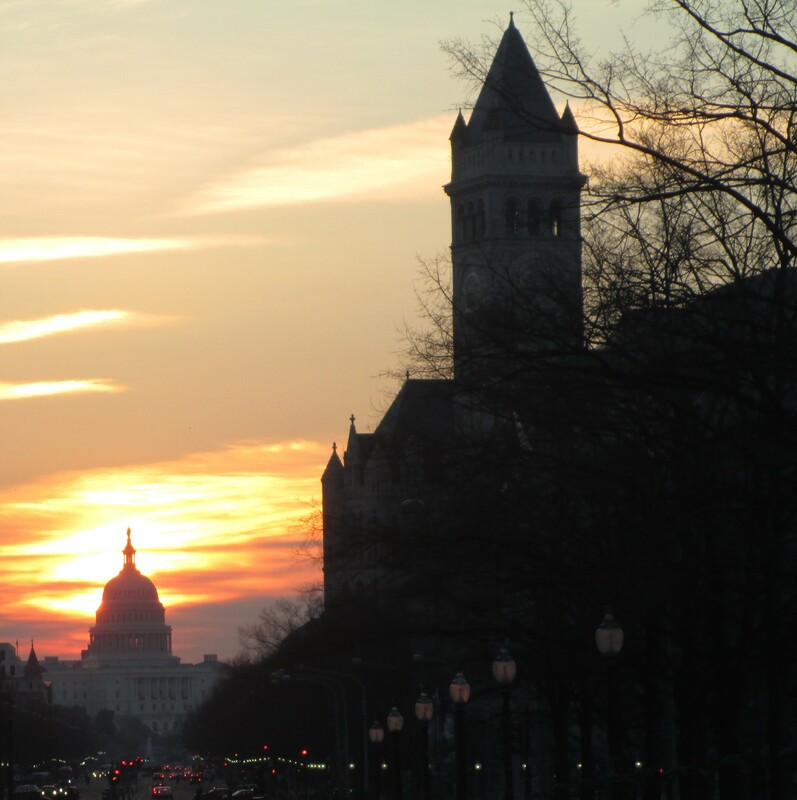 Whether I was walking down Pennsylvania Avenue, standing on the South Lawn, or entering the Capitol Building, what struck me most about this day was how much history has taken place there, and how America’s identity continues to shift and change as time goes on.